Websites offering deals on a daily basis are popping up all over the place. 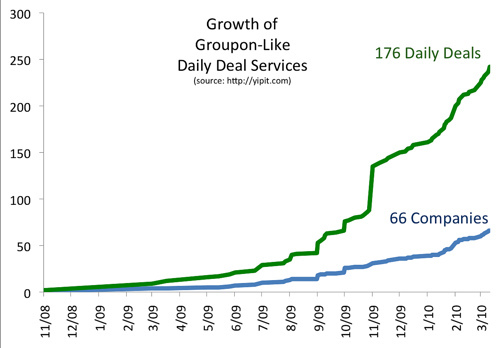 In Russia, the strategy is apparently to copy the entire website design and business model of one of the most promising companies in this space, Groupon, while in Germany Daily Deal battles with City Deal and the UK has more than its share of group buying websites. But it’s not like the concept isn’t catching on and ‘inspiring’ opportunistic entrepreneurs in the United States as well – much to the contrary, there’s been a surge of new daily deals websites in those parts too over the past couple of weeks alone. The team behind Yipit, which recently launched as a one-stop shop offering a clear, aggregated overview of deals on the Web, have been tracking this space closely and poured the data collected to date in a couple of telling graphs. When Yipit launched a little over a month and a half ago (! ), the startup could already identify 30 daily-deal Web services. 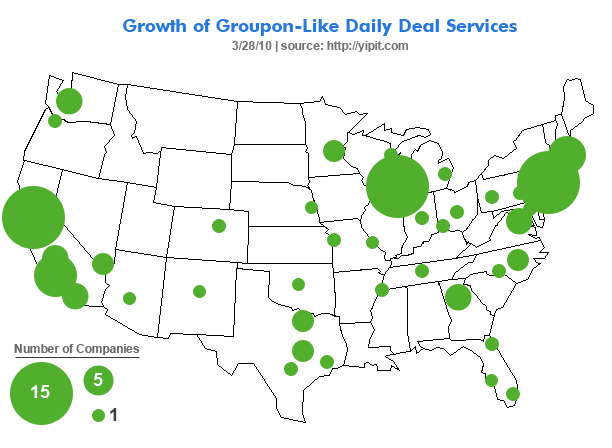 Today, the company tracks deals from no less than 66 Groupon -like websites across the United States, more than double the number it counted less than two months ago. Needless to say, this makes Yipit’s value proposition more attractive, too. Some other well-known companies in this space besides Groupon include LivingSocial, Ideeli and Tippr, but as you can tell from the graphs above, there are many more. Yipit is intend on riding the wave of daily deal services increasing in numbers and popularity quickly, and is keen on expanding to more cities in the near future. Today, the company aggregates deals for Boston, Chicago, Los Angeles, New York and San Francisco, but promises cities like Atlanta, Las Vegas and even London will be added soon. Yipit has so far attracted over 10,000 registered users, and claims those have collectively saved $100,000 after finding out about some 18,000 deals in the first month since its launch in mid-February. The company is now setting up city-specific Twitter accounts (e.g. @YipitSF for San Francisco) to distribute the most popular daily deals in each of the covered markets. Last but not least: Yipit just raised $250,000 from friends and family.